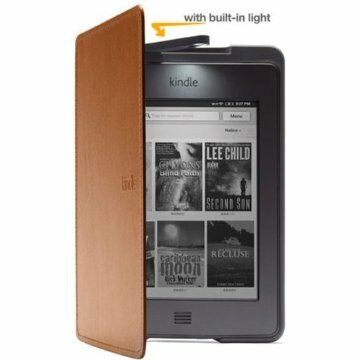 Before Barnes & Noble(s bks) debuted its new Nook with GlowLight last week, I had already purchased a Kindle Touch(s amzn). But I’ve been keeping my wife awake at night as I read in bed because my Touch has no light. I tried a third-party light with adjustable neck and clip, but I’m not a fan of changing the button cell batteries every so often. Instead, I opted for the official Kindle Touch case with integrated light. At $59, this case is relatively expensive when you consider that I paid $99 for the Kindle Touch with Special Offers. The same case without a light is $39, but a third-party light can easily set you back another $20. The big advantage here is that the LED bulb draws power from the Kindle itself. There’s no need to buy or change batteries for the light. I haven’t noticed a big drop in battery life since using this with my Kindle Touch, although it’s surely going to cause the e-reader to be recharged more often. Overall, I love this purchase. I can still read in low-light or dark settings and not worry about keeping my wife awake. Actually, the more I think about it, she probably appreciates the new case even more than I do! Stay tuned as our Nook GlowLight review unit is on the way. Kevin, does the cover inhibit the sound coming from the speakers on the rear of the Kindle Touch? Does the light have a diffuser or could one create something like that with, for example, scotch tape? It’s funny how the light seems so minimal during the day, but feels like you’re holding a supernova when reading at night. Love the idea of this, hate that it costs $60. This should not cost more than $40 and I’d imagine at $30 they’d still have some decent margins. Wish there were some third party options but Amazon has probably excluded this type of item from licensing so they can make some money themselves on accessories (never mind that I’ve already bought over $200 in books from Amazon because of the Kindle Touch).